Return on Investment (ROI) is our goal for each one of our Internet marketing and SEO clients. Each marketing plan and website is customized to meet our client's needs and business goals. Nothing is left to guessing. Target Marketing Solutions clients know exactly how their marketing programs and websites are performing. All Internet and search marketing services are tracked. Each client received regular reports containing statistical data verifying outcomes. Each website we create has tracking code on it. 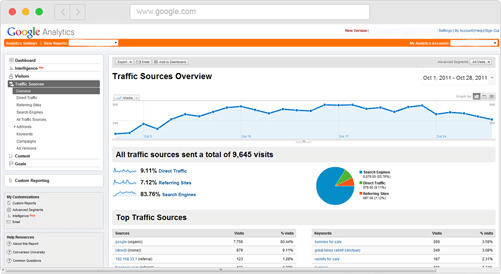 You will know exactly how much traffic your site is getting, where that traffic is coming from, the search engines and keywords used to find your site, which pages were viewed, how long the viewer was on your site, etc.... Click on the image to see a website report. Our Search Marketing programs are also tracked. 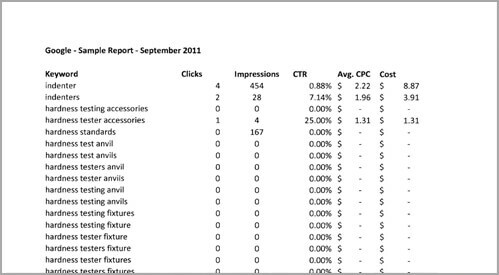 Clients receive keyword reports at least monthly. We also use a number of other methods to verify the effectiveness of programs and confirm conversion. A conversion is defined as a contact (i.e., call, email, sale). Our Internet marketing consultants are experienced experts who know how to bring about significant results and maximize each client's marketing dollars. One of the best ways to evaluate our services is to see what our clients say about our results. So read what our clients say about Target Marketing Solutions services. "We have discovered that the money that we spend with Target Marketing has brought us very nice dividends in the form of lead generation and more importantly, new work for Russells. We continue to use Target's expertise to "fine tune?? our website and PPC campaign." Russells Technical Products. Services Contracted: Pay-Per-Click, Search Engine Optimization (SEO)/Website Development. "Visits to our site www.stjohn.org are up, due in large part to increased traffic from Google, Yahoo, and other search engines, thanks to our keyword campaigns" St. John Health System. Services Contracted: Pay-Per-Click Management.